Harris Corporation’s DNA was forged in the broadcast TV world, so it makes sense that they would be aggressively targeting the digital signage space. Harris has done that this year with a new traffic/scheduling/billing software product, called Punctuate. particularly plugged into the NAB show because a lot of digital signage interest has been generated from other camps – including the commercial AV world, retail, advertising, and other non-broadcast arenas. But 2009 will witness one of the most important NAB shows in years, regardless of what camp you came from. From an NAB perspective, there is no more promise for growth than in digital signage, a market that was born in broadcast and holds the promise of more new screens for broadcasters than any new vertical since the dawn of the internet. Digital signage (“narrowcast” content centrally managed but pushed out to public spaces in retail, transportation, education, or corporate settings) is accelerating rapidly, even in the midst of a recession in the larger economy. Many if not most of the digital signage content management software solutions flooding the digital signage space are really broadcast content management products repurposed for digital signage and DOOH (Digital Out of Home). Scala is a digital signage content management software company that learned a lot of lessons in the NAB world before forging into digital signage. But the transition is not as seamless as it might look at first glance — especially for the end-user or integrator. Because managing content for oftencobbled- together retail networks, or over corporate IT systems, for example, is not as easy as doing it in-house broadcast suites. The digital signage content management software that organizes and directs how content will play is central to providing the unique, powerful, and inherent capabilities of digital signage. But the selection of software can be complex and daunting to and end-user. There are more than 100 software providers for digital signage and, to the non-broadcast customer, software doesn’t have the kind of “specs” that allow easy A/B comparison when deciding which product to go with. This problem is more pronounced in the digital/OOH space, where software specs are more confusing because of multiple formats across networks, different screen configurations (a mix of 3x4, 16x9, 16x10, etc. ), SaaS vs. imbedded platforms, interactivity requirements, and a multitude of other variables that make moving content out to public spaces much more challenging than one-way broadcasting out to standard- format screens. Look to NAB to provide a glimpse at the next-gen software that is both rules-based – á la broadcast TV — but that is scalable up to a cross-network, cross-format level that will bring the new digital signage market up to par with its broadcast TV parent. A good example of a successful transition is Harris. Harris Corporation’s DNA was forged in the broadcast TV world, so it makes sense that they would be aggressively targeting the digital signage space. 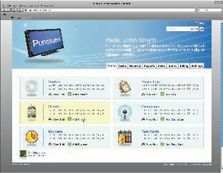 Harris has done that this year with a new traffic/ scheduling/billing software product for the digital signage market, called Punctuate, that is a direct result of Harris’ experience in the broadcast world. Punctuate is not just about managing and scheduling content — it’s also about helping to sell “media buys” in public spaces. Because it will enable sellers of in-store network spaces, for example, to more clearly define the media buy, as is done routinely in the broadcast TV world. This is much needed in digital signage: broadcast-style traffic/billing that will propel the new medium to a true media buy, not just a technology buy. As we’ve seen from the onset of the digital signage market, software solutions born in the NAB world have made AV in public spaces so much easier than would have been possible if starting from scratch.